Just a couple weeks past the symbolic 100-day marker of the Trump presidency, prominent Democrats are increasingly urging the president’s impeachment for alleged improprieties related to the so-called “Russiagate” controversy. More than two dozen Democratic members of congress — and a couple Republicans — have already alluded to the possibility of initiating impeachment proceedings, and following Donald Trump’s recent firing of FBI Director James Comey, those calls are intensifying. Democratic Rep. Al Green of Texas last week became the first congressman to call for Trump’s impeachment from the floor of the House of Representatives. The congressman went on to describe the reasons he feels impeachment is necessary. Stating that “our democracy is at risk,” Green explained that when President Trump “fired the FBI director who was investigating the President for his connections to Russian involvement in the President’s election,” the president unlawfully obstructed justice into a federal investigation. For the sake of the rule of law, the congressman stated that Congress must initiate impeachment proceedings to ensure the principle of no one being above the law is upheld. His calls have been echoed by senators and congressmen speaking out on television talk shows and Twitter, indicating a growing trend in Washington toward the real possibility of removing this president less than a year into his first term. There are two things noteworthy about these developments. One is that the very basis for the impeachment calls rests on a number of assumptions that may very well lack any basis in fact. For all of the talk about Trump’s alleged “collusion” with the Russian government, what is left unsaid is that the “collusion” allegations relate to a fundamentally unproven assertion – that the Russian government actually interfered in Election 2016 as part of a plot to ensure that Trump defeated Hillary Clinton in the Nov. 8 presidential election. Although this conspiracy theory has been endlessly promoted in the U.S. media and is essentially accepted as a self-evident truth by Democratic partisans, it should not be forgotten that it lacks any proof whatsoever and that there are a number of alternative possibilities for how WikiLeaks obtained the incriminating emails from the DNC. One such theory is that they were provided by former DNC staffer Seth Rich, who was mysteriously murdered in a so-called “botched robbery” on the streets of Washington, DC, on July 10, 2016. This is the possibility that WikiLeaks’ Julian Assange alluded to when he offered a $20,000 reward for information leading to a conviction in Rich’s killing. Although WikiLeaks has a strict policy of not naming its sources, the reward for information about the Rich murder coupled with the fact that Assange has unequivocally stated that Russia was not the source of the leaks should raise at least a few doubts about the “official conspiracy theory,” i.e. the theory promoted by mainstream media, the U.S. intelligence community and the Democratic Party that Russia – in collusion with the Trump campaign – somehow “meddled” in the election. It should also be noted that the closest thing to evidence to back up this official conspiracy theory amounts to a series of unproven assertions put forward by the U.S. intelligence community, which it should be recalled, has been known to tell a lie or two on occasion. In an “analytic assessment” published Jan. 6, the Director of National Intelligence concluded that the Kremlin had hacked the DNC emails in an effort to undermine Clinton’s campaign. So, instead of offering proof, the report “covers the motivation and scope of Moscow’s intentions regarding US elections and Moscow’s use of cyber tools and media campaigns to influence US public opinion.” In other words, the intelligence community is offering its guesses as to why Moscow may have been motivated to engage in an “act of war” against the U.S. government without sharing a shred of proof that it actually did. The oft-cited, but evidence-free, CIA/FBI/NSA report of Jan. 6 – crafted by selected senior analysts, according to then-Director of National Intelligence James Clapper – is of a piece with the “high-confidence,” but fraudulent, National Intelligence Estimate 15 years ago about weapons of mass destruction in Iraq. Basically, it’s propaganda designed to influence the American people of a predetermined conclusion – in this case that the Russian government is acting as a hostile power to interfere in “American democracy,” not unlike how the intelligence community 15 years ago worked to convince the American people that Iraq posed a grave threat with its non-existent weapons of mass destruction program. Besides the complete lack of evidence to back up the official conspiracy theory of Russian interference in Election 2016, another thing striking about this line of attack against Trump is the fact that it ignores any number of other possibly impeachable offenses that have been committed by Trump since the day he took office. These include violations of the Constitution’s emoluments clause, which is intended to prevent corruption and conflict of interests by ensuring that nobody holding a position of trust with the United States government can receive payments from foreign governments, whether gifts or a salary or profits. If you have somebody who’s making profits from dealing with foreign governments or companies controlled by foreign governments, that person must dispense with those profits, cannot receive that money, while holding any position of trust with the United States government. That applies to every U.S. government employee, including the president. And so, what this means is that, for Donald Trump, if he’s going to hold onto these business enterprises, which present a whole range of other conflict of interest problems, to satisfy the Constitution, at a bare minimum, what he’s going to have to do is get the foreign government money and money from foreign government-controlled corporations out of his business enterprise. And this includes foreign diplomats staying at the hotels at government expense, foreign governments having big parties in his hotels and canceling reservations at the Four Seasons, going over to the Trump Hotel, to curry favor. All of that is unconstitutional. Another area of concern that Democrats appear to be turning a blind eye to is regarding the mounting evidence of war crimes committed since Trump was sworn in as president last January. The war crimes began within days of Trump’s inauguration, with Navy SEALs conducting a raid in Yemen on January 29 raid ending up with dozens of innocents killed and the loss of a $70 million MV-22 Osprey aircraft. Two deaths stand out. One was the Trump Administration’s first combat fatality: 36- year old Chief Special Warfare Operator William “Ryan” Owens. The second was an 8-year old American citizen, Nawar Al-Awlaki. Nawar’s father was the US-born cleric and Al-Qaeda recruiter and propagandist, Anwar Al-Awlaki. Al-Awlaki was assassinated in a US drone strike in Yemen on September 30, 2011. Shortly afterwards, Nawar’s 16-year old brother Abdulrahman was also killed by a US drone, probably inadvertently. Thanks to the US, the Awlakis—father, son, and daughter—are together again. It’s too bad the Awlakis can’t thank the Pentagon themselves. Besides this incident, the routine use of flying robots (commonly known as “drones”) to rain death from above half-way around the world has shot up 432% under the Trump administration, continuing a trend started under the Bush-43 administration and intensified under President Obama to use unmanned aerial vehicles to indiscriminately kill terrorist suspects while also terrorizing civilian populations. Because the United States is not involved in an armed conflict with Yemen, Pakistan, and Somalia, nor has any of these countries attacked the United States, Trump’s actions are violations of the United Nations Charter. “Trump does not have Congressional authorization to attack Syria, a country that has not attacked U.S.,” Lieu pointed out. While Lieu’s complaint was a welcome departure from the deafening silence that usually accompanies acts of U.S. military aggression, it should be kept in mind that voices such as his are the exception to the rule. And compared to the growing chorus of calls for impeachment over unfounded “Russiagate” allegations, the voices in the wilderness complaining of U.S. war crimes remain few and far between. In other words, what the deep state cannot abide is rapprochement, what it really wants is endless war. There are many things unprecedented about the incoming Trump presidency, not the least of which being the fact that the United States has never before been led by a billionaire with business interests spanning the globe. Only time will tell how Donald Trump ultimately ends up balancing his global business empire with running the U.S. government – but so far it is not looking promising. In fact, as Richard Painter, former ethics lawyer in the George W. Bush administration, has pointed out, he may be in violation of the U.S. Constitution’s emoluments clause on day one of his presidency. This clause is one of the most critical conflict of interest provisions for all U.S. government officials. Basically, it is intended to ensure that nobody holding a position of trust with the United States government can receive payments from foreign governments, whether gifts or a salary or profits. In a word, Trump’s proposed solutions are laughable. So what if he donates “profits” from foreign governments to the United States Treasury? All he has to do is accept money from a foreign government and he’s already in violation of the emoluments clause – it doesn’t matter whether it constitutes a profit, or where the money ultimately ends up. Focusing on profits, moreover, ignores the countless ways that his businesses can benefit from foreign governments that would never show up on a balance sheet. For example, it was widely reported that Trump lobbied a British political ally to oppose a wind farm project because it might ruin the view from his golf course in Aberdeen, Scotland. Besides, Trump on Wednesday again refused to reveal his tax returns and declared that the American people do not care about them. A pledge to turn over profits is meaningless without detailed accounting. While his global business holdings may render his conduct as president unconstitutional, his incoming administration’s nepotism and conflicts of interests also pose serious challenges to international norms, and may render the United States in violation of the United Nations Convention against Corruption. As a state party to this convention, the United States has agreed to prevent conflicts of interest and corruption – including through “revolving-door practices,” such as placing corporate chieftains in charge of government regulatory agencies. Each State Party shall, in accordance with the fundamental principles of its domestic law, endeavour to adopt, maintain and strengthen systems that promote transparency and prevent conflicts of interest. Preventing conflicts of interest by imposing restrictions, as appropriate and for a reasonable period of time, on the professional activities of former public officials or on the employment of public officials by the private sector after their resignation or retirement, where such activities or employment relate directly to the functions held or supervised by those public officials during their tenure. The United States has long flouted these international obligations by allowing the corporate-government revolving door to swing freely and lucratively, but the violations of international norms will likely reach extraordinary new levels under Trump. While there is nothing new about conflicts of interest and corruption in the U.S. government (as reported by Compliance Campaign among others for years) the graft will likely dramatically worsen under Trump. In the past, the corruption has always been obscured by a veneer of legitimacy that masks the profiteering by the oligarchy running the government, but that mask is about to be removed. But with the sleaze, fraud and vice about to be unleashed on the world, the United States may become more internationally isolated, possibly hastening the end of U.S. hegemony around the world. This might not ultimately be such a bad thing, as opening the global system to a more multilateral balance of power could end up being a net positive for the world, and U.S. isolation could help bring this about. The United States government is finding itself on the defensive this month, being taken to court over a host of policies that violate constitutional and international law. First, on March 10, the American Civil Liberties Union, the Wikimedia Foundation, Human Rights Watch, Amnesty International USA and other groups filed a lawsuit against the U.S. National Security Agency challenging one of its mass surveillance programs that the plaintiffs say violates Americans’ privacy and makes individuals worldwide less likely to share sensitive information. In particular, the lawsuit focuses on the NSA’s “upstream” surveillance, which involves the NSA’s tapping into the physical infrastructure of the internet, compromising Americans’ online communications with each other and with the rest of the world. In the course of its surveillance, the NSA copies and combs through vast amounts of Internet traffic, which it intercepts inside the United States with the help of major telecommunications companies. It searches that traffic for keywords called “selectors” that are associated with its targets. The surveillance involves the NSA’s warrantless review of the emails and Internet activities of millions of ordinary Americans. The lawsuit argues that the NSA is infringing on the plaintiffs’ First Amendment rights and violating their privacy rights under the Fourth Amendment. The complaint also argues that the surveillance oversteps the authority granted by Congress under the FISA Amendments Act. When Human Rights Watch can’t assure the privacy of the people with whom we work to expose and halt human rights abuses, we can’t protect their security either. Lives are in the balance, not to mention freedom of information, association, and speech. Activists in Ethiopia, defense attorneys in France, and officials working in Indonesia won’t call or email us sensitive information about ongoing rights violations because they rightly fear surveillance. 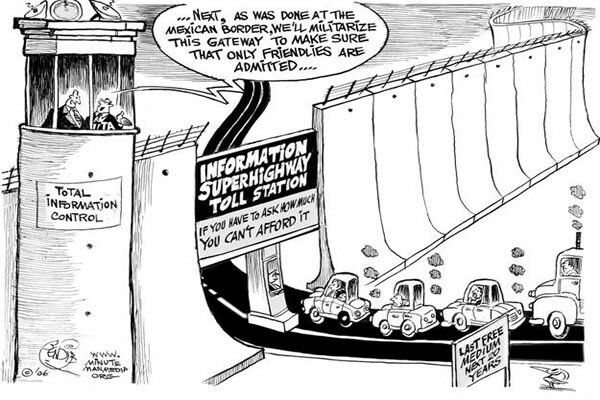 We have to get the facts face-to-face or not at all, and either way, that’s costly. People know the domestic government may well have an intelligence partnership with the US, and any leak of US-monitored communications may result in arbitrary arrest, prosecution, assault, or worse. Last year, we documented the pall that surveillance has thrown over journalists and lawyers in the US, who now must go to extreme lengths to protect their confidential communications, or just forgo the reporting and defense strategies that keep our society informed, fair, and accountable. HRW and the other groups in the lawsuit said that upstream surveillance “reduces the likelihood” that clients, journalists, foreign government officials, victims of human rights abuses and other individuals will share sensitive information with them. Lila Tretikov, executive director of the Wikimedia Foundation, and Wikipedia founder Jimmy Wales wrote in the New York Times that they were concerned about where data on their users ends up after it is collected by the NSA. Noting close intelligence ties between the United States and Egypt, they said a user in Egypt would have reason to fear reprisal if she edited a page about the country’s political opposition. The day after the lawsuit was filed challenging the NSA’s mass surveillance, the Associated Press sued the State Department to force the release of email correspondence and government documents from Hillary Clinton’s tenure as secretary of state. The legal action was a response to Clinton’s attempts to circumvent transparency laws by using a private email account while she headed the State Department and followed repeated requests filed under the U.S. Freedom of Information Act that have gone unfulfilled, according to the AP. The FOIA requests and the suit seek materials related to her public and private calendars; correspondence involving aides likely to play important roles in her expected campaign for president; and Clinton-related emails about the Osama bin Laden raid and National Security Agency surveillance practices. “After careful deliberation and exhausting our other options, The Associated Press is taking the necessary legal steps to gain access to these important documents, which will shed light on actions by the State Department and former Secretary Clinton, a presumptive 2016 presidential candidate, during some of the most significant issues of our time,” said Karen Kaiser, AP’s general counsel. The suit filed by the AP came a day after Clinton broke her silence about her use of a private email account while she was America’s top diplomat. In defending her actions – which were widely seen as a crude attempt to avoid government transparency requirements – the likely 2016 Democratic presidential candidate claimed that her decision to forgo the official State Department email system was simply a matter of personal convenience. “At the time, this didn’t seem like an issue,” Clinton said in a March 11 press conference. Clinton insisted she was not violating any rules or seeking to hide her communications. “I fully complied by every rule I was governed by,” she claimed. The senior-most executive branch official in charge of freedom-of-information matters for over a quarter-century flatly disagreed. Daniel Metcalfe, whose job it was to help four administrations interpret the Freedom of Information Act, offer advice, and testify before Congress on their behalf, called Clinton’s explanation laughable. Another challenge to the U.S. government playing out in the courts is a lawsuit filed this week against the lawless and secretive CIA drone assassination program being carried out by the Obama administration. The ACLU sued the White House in federal court on March 16 in an attempt to compel the release of classified information regarding the program of extrajudicial assassinations. But the administration has failed to follow through on these commitments to openness, and it is continuing to withhold basic information­. When it has released anything – or been compelled to by lawsuits – discussion of crucial aspects of the program have been omitted or redacted. This lack of transparency makes the public reliant on the government’s self-serving and sometimes false representations about the targeted-killing program. The Bureau of Investigative Journalism estimates that 2,442 to 3,942 people in Pakistan have been killed by CIA drone strikes since 2004. Hundreds more people are thought to have been killed by U.S. drones in Yemen, Somalia and Afghanistan. The White House has formally acknowledged that four of those killed by U.S. drone strikes were United States citizens, one of whom was just 16 years old. Despite these concerns, the United States has decided to not only continue its drone assassination program but to begin exporting drones to countries around the world so that they may also begin remotely assassinating people without charge or trial. Unfortunately, it will be the United States – perhaps the world’s most frequent and flagrant violator of international law – determining whether these standards are met. With one month to go before the public comment period ends on the Federal Communications Commission’s recent vote to advance a proposal that would end net neutrality and create a system of paid-prioritization online, a new report has come out criticizing the FCC’s actions as potentially undermining the U.S. government’s international obligations regarding freedom of expression. The legal analysis issued Monday by the Organization for Security and Cooperation in Europe – an inter-governmental organization that counts the United States as one of its 57 members – found that the rules on net neutrality (the principle that internet service providers treat all data equally and not discriminate based on content or price paid) proposed by the FCC may violate one or more of the following international accords to which the United States has subscribed: the Universal Declaration of Human Rights, the International Convention on Civil and Political Rights, and the 1990 OSCE Copenhagen Document. Prepared for the Office of the OSCE Representative on Freedom of the Media by George Washington University Law School Professor Dawn Carla Nunziato, the report points out that Article 19 of both the Universal Declaration of Human Rights and the ICCPR protects the right to freedom of expression and to seek, receive and impart information and ideas through any media and regardless of frontiers. Similarly, the FCC’s Proposed Rules would allow a broadband provider like Verizon to enter into an arrangement with the Republican National Committee to anoint it as the exclusive premium political site for all Verizon subscribers, while disadvantaging the Democratic National Committee’s and other political sites. Otherwise protected speech – a blog critical of Verizon’s latest broadband policies, a disfavored political party’s website – could be disfavored by broadband providers and not provided to Internet users in a manner equal to other, favored Internet content – subject only to the Proposed Rules’ vague prohibition against commercially unreasonable conduct. Such a regime would endanger the free flow of information on the Internet, would threaten freedom of expression and freedom of the media, and would herald the beginning of the end of the Internet as we know it. These very real prospects led the OSCE Representative on Freedom of the Media, Dunja Mijatovic, to weigh in on the controversy yesterday. Yet, the powerful chairmanship of Wheeler at the FCC demonstrates once again how the United States routinely flouts this obligation to prevent conflicts of interests. Prior to joining the FCC, Wheeler worked as a venture capitalist and lobbyist for the cable and wireless industry, with positions including President of the National Cable Television Association (NCTA) and CEO of the Cellular Telecommunications & Internet Association (CTIA). He also raised over $500,000 for Barack Obama’s two campaigns. As a reward for this financial backing, President Obama then appointed him to his current position where is empowered with rewriting the rules for the industry that once employed him. This sort of patronage is not only prohibited under the Convention against Corruption, but now, as we see, is leading to multiple violations of international principles, as documented by the OSCE in its report issued Monday. Mijatovic expressed her hope that her recommendations will be taken into consideration by the FCC. The legal analysis of the proposed net neutrality rule changes is available here. To comment to the FCC regarding its proposed rules regarding net neutrality, click here. The Washington Post is reporting that the National Security Agency has broken its own privacy rules or overstepped its legal authority thousands of times each year since 2008, citing top-secret documents provided by whistleblower Edward Snowden. Most of the infractions involved illegal surveillance of U.S. citizens or foreign intelligence targets in the United States, ranging from significant violations of law to typographical errors that resulted in unintended interception of U.S. emails and telephone calls, according to the Post. 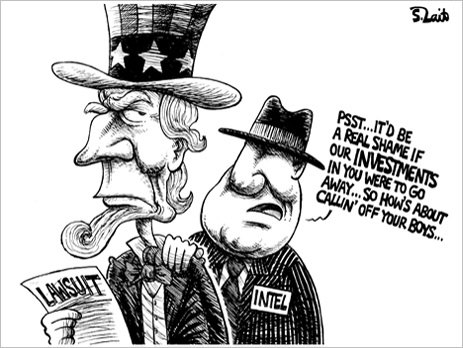 In one instance, the NSA decided it would not report the unintended surveillance of Americans to the FISA court. A notable example in 2008 was the interception of a “large number” of calls placed from Washington when a “programming error” confused U.S. area code 202 for 20, the international dialing code for Egypt. The NSA audit that Snowden provided to the Post, dated May 2012, counted 2,776 incidents in the preceding 12 months of unauthorized collection, storage, access to or distribution of legally protected communications. In other words, the NSA – which was granted greatly expanded legal authority in 2008 by Congress in the FISA Amendments Act – has been routinely flouting Americans’ legal protections with impunity for years. The incidents are not only infractions of of U.S. law, but also international law. Human rights conventions and national constitutions almost universally call for the protection of the right to privacy – the challenge is ensuring that governments comply with this requirement, particularly with respect to new technologies and in countries that lack the rule of law. The modern privacy benchmark at an international level can be found in Article 12 of the 1948 Universal Declaration of Human Rights, which specifically protects territorial and communications privacy. Numerous other international human rights treaties recognize privacy as a right: Article 17 of the International Covenant on Civil and Political Rights 1966, Article 14 of the United Nations Convention on Migrant Workers, and Article 16 of the UN Convention of the Protection of the Child. Regional conventions that recognize the right to privacy includes Article 10 of the African Charter on the Rights and Welfare of the Child, Article 11 of the American Convention on Human Rights, Article 4 of the African Union Principles on Freedom of Expression, Article 5 of the American Declaration of the Rights and Duties of Man, Article 21 of the Arab Charter on Human Rights, and Article 8 of the European Convention for the Protection of Human Rights and Fundamental Freedoms. An April 2013 report issued by the United Nations about the threat that government surveillance poses to the enjoyment of basic human rights found that state surveillance of communications is ubiquitous and such surveillance severely undermines citizens’ ability to enjoy a private life, to express themselves freely and enjoy other fundamental freedoms. Toward this end, civil society groups, industry and international experts in communications surveillance law, policy and technology have developed the International Principles on the Application of Human Rights to Communications Surveillance, formally launched last month. Privacy is a fundamental human right, and is central to the maintenance of democratic societies. It is essential to human dignity and it reinforces other rights, such as freedom of expression and information, and freedom of association, and is recognised under international human rights law. Activities that restrict the right to privacy, including communications surveillance, can only be justified when they are prescribed by law, they are necessary to achieve a legitimate aim, and are proportionate to the aim pursued. Before public adoption of the Internet, well-established legal principles and logistical burdens inherent in monitoring communications created limits to State communications surveillance. In recent decades, those logistical barriers to surveillance have decreased and the application of legal principles in new technological contexts has become unclear. The explosion of digital communications content and information about communications, or “communications metadata” — information about an individual’s communications or use of electronic devices — the falling cost of storing and mining large sets of data, and the provision of personal content through third party service providers make State surveillance possible at an unprecedented scale. Meanwhile, conceptualisations of existing human rights law have not kept up with the modern and changing communications surveillance capabilities of the State, the ability of the State to combine and organize information gained from different surveillance techniques, or the increased sensitivity of the information available to be accessed. The frequency with which States are seeking access to both communications content and communications metadata is rising dramatically, without adequate scrutiny. When accessed and analysed, communications metadata may create a profile of an individual’s life, including medical conditions, political and religious viewpoints, associations, interactions and interests, disclosing as much detail as, or even greater detail than would be discernible from the content of communications. Despite the vast potential for intrusion into an individual’s life and the chilling effect on political and other associations, legislative and policy instruments often afford communications metadata a lower level of protection and do not place sufficient restrictions on how they can be subsequently used by agencies, including how they are data-mined, shared, and retained. In order for States to actually meet their international human rights obligations in relation to communications surveillance, they must comply with the principles set out below. These principles apply to surveillance conducted within a State or extraterritorially. The principles also apply regardless of the purpose for the surveillance — law enforcement, national security or any other regulatory purpose. They also apply both to the State’s obligation to respect and fulfil individuals’ rights, and also to the obligation to protect individuals’ rights from abuse by non-State actors, including corporate entities. The private sector bears equal responsibility for respecting human rights, particularly given the key role it plays in designing, developing and disseminating technologies; enabling and providing communications; and – where required – cooperating with State surveillance activities. Nevertheless, the scope of the present Principles is limited to the obligations of the State. Legality: Any limitation on the right to privacy must be prescribed by law. Legitimate Aim: Laws should only permit communications surveillance by specified State authorities to achieve a legitimate aim that corresponds to a predominantly important legal interest that is necessary in a democratic society. Necessity: Laws permitting communications surveillance by the State must limit surveillance to that which is strictly and demonstrably necessary to achieve a legitimate aim. Adequacy: Any instance of communications surveillance authorised by law must be appropriate to fulfill the specific legitimate aim identified. Proportionality: Decisions about communications surveillance must be made by weighing the benefit sought to be achieved against the harm that would be caused to users’ rights and to other competing interests. Due process: States must respect and guarantee individuals’ human rights by ensuring that lawful procedures that govern any interference with human rights are properly enumerated in law, consistently practiced, and available to the general public. User notification: Individuals should be notified of a decision authorising communications surveillance with enough time and information to enable them to appeal the decision, and should have access to the materials presented in support of the application for authorisation. Transparency: States should be transparent about the use and scope of communications surveillance techniques and powers. Public oversight: States should establish independent oversight mechanisms to ensure transparency and accountability of communications surveillance. Integrity of communications and systems: States should not compel service providers, or hardware or software vendors to build surveillance or monitoring capabilities into their systems, or to collect or retain information. Safeguards for international cooperation: Mutual Legal Assistance Treaties (MLATs) entered into by States should ensure that, where the laws of more than one State could apply to communications surveillance, the available standard with the higher level of protection for users should apply. Safeguards against illegitimate access: States should enact legislation criminalising illegal communications surveillance by public and private actors. With the new revelations exposed by the Post along with all the other Snowden leaks from recent months, it is clear that many – if not all – of these 13 principles are being violated routinely by the NSA’s surveillance activities. To sign on to the International Principles, click here. Click here to tell Congress to end the U.S. surveillance state. Events of the past week have demonstrated that despite occasional grumblings from Europe about U.S. misconduct on the world stage, at the end of the day, it is only Latin America that is willing to take concrete action to challenge the systemic lawlessness of the U.S. government. Although European leaders were humiliated by the United States when it was revealed by Edward Snowden’s leaks that the NSA has been tapping the telephone lines and computer networks of EU offices in Brussels, New York and Washington — as well as the governments of Germany, France, Greece, Italy and others — Europe largely fell into line in submitting to U.S. dictates regarding Snowden’s asylum requests. The individual’s right to privacy is also enshrined in numerous human rights conventions including in Article 12 of the 1948 Universal Declaration of Human Rights, Article 17 of the International Covenant on Civil and Political Rights 1966, Article 14 of the United Nations Convention on Migrant Workers, and Article 16 of the UN Convention of the Protection of the Child. It is also guaranteed by Article 8 of the European Convention for the Protection of Human Rights and Fundamental Freedoms. Despite Snowden revealing these U.S. violations of international law on European territory, ten EU countries indicated that they would deny the whistleblower’s political asylum requests, with German Foreign Minister Guido Westerwelle saying that Snowden’s request would be reviewed by German authorities “according to the law,” but he “could not imagine” that it would be approved. This is despite the bluster displayed by German leaders when the story broke about the NSA snooping into the emails and phone conversations of European nations, including Germany. Angela Merkel, the German chancellor, described the disclosures of massive U.S. spying in Europe as unacceptable. The French president, François Hollande, also called the spying intolerable. “We cannot accept this kind of behaviour between partners and allies,” Hollande said. “We ask that this stop immediately.” French Foreign Minister Laurent Fabius said that if confirmed, the activities would be “totally unacceptable”. Martin Schulz, the president of the European Parliament, said that if the report was correct, it would have a “severe impact” on relations between the EU and the United States. “On behalf of the European Parliament, I demand full clarification and require further information speedily from the US authorities with regard to these allegations,” he said in a statement. But when it comes to the tangible actions – rather than just strong words – that are needed to effectively stand up to the United States, European leaders are missing in action. Indeed, when push comes to shove, and these leaders are leaned upon to take unprecedented and legally questionable measures to assist the U.S. in its overzealous manhunt of Edward Snowden, they have largely fallen into line. For example, when the United States received a tip that Snowden may have been on a plane carrying Bolivian president Evo Morales, who was flying home from a Moscow summit via Western Europe, European governments fell over themselves to do the bidding of the United States, with France, Spain and Portugal all refusing to let Morales’ plane through their airspace. The plane was forced to land in Austria, where it remained grounded for 14 hours as the authorities determined that Snowden was not on board. Morales called the rerouting of his plane a violation of national sovereignty and a provocation to all of Latin America, urging European countries to “free themselves” from the undue influence of the United States. 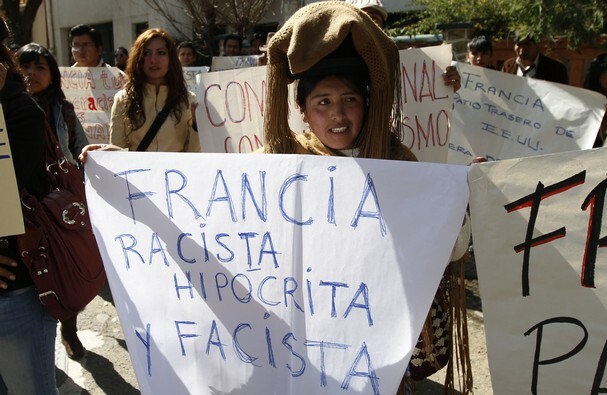 “It is an open provocation to the continent, not only to the president; they use the agent of North American imperialism to scare us and intimidate us,” Morales told supporters gathered at the airport in La Paz to greet him. “I regret [saying] this, but I want to say that some European countries should free themselves from North American imperialism,” he said. Venezuela’s president, Nicolas Maduro, criticized European countries’ role in the rerouting of Morales’s plane, describing it as an act of cowardice. “The European people have seen the cowardice and the weakness of their governments, which now look like colonies of the U.S.,” he said on Friday. The actions were also likely a violation of international law. Michael Bochenek, director of law and policy at Amnesty International, said that the grounding of Morales’ plane, as well as reports that Vice President Joe Biden had phoned the Ecuadorean leader, Rafael Correa, to block asylum for Snowden, carried serious legal implications. Unlike the European countries cowering in the face of U.S. power even when they are humiliated and provoked, Latin America responded forcefully to the lawless behavior of the United States. Following a meeting of Latin American leaders on Thursday, three countries – Bolivia, Venezuela and Nicaragua – stepped forward to indicate that they would accept Snowden as a political refugee fleeing persecution by the United States. Venezuela’s president Nicolas Maduro cited humanitarian grounds for his decision to help the whistleblower. “We have decided to offer humanitarian asylum to the American Edward Snowden to protect him from the persecution being unleashed by the world’s most powerful empire,” Maduro said. For their part, EU politicians have questioned the future of trade talks set to begin this week. The European Commission has officially asked Washington to investigate the allegations while France’s government said that it wanted to delay the start of U.S.-EU trade talks. A German official has suggested that Europeans stop patronizing American Internet companies such as Google and Facebook if they are concerned about their privacy. With Bradley Manning’s court martial trial finally set to begin next week — more than three years after his initial arrest on suspicion of being the source of the biggest leak of classified documents in U.S. history — various campaigns are gaining momentum to ensure that he receives a fair and transparent trial, and to urge the world’s leading human rights organizations to recognize Manning as a political prisoner or prisoner of conscience. 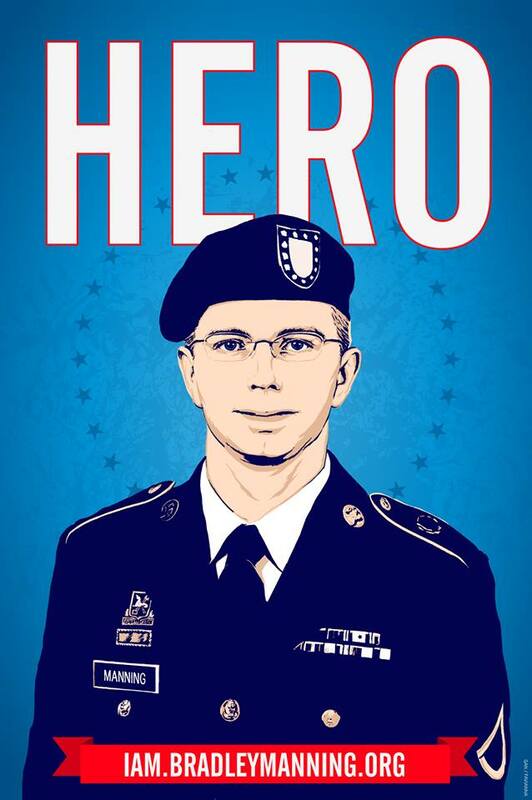 It is very important that the two biggest human rights organizations acknowledge Bradley Manning as a “Political Prisoner” and/or “Prisoner of Conscience” before his trial begins on June 3, 2013. If his actions can be misconstrued as “aiding the enemy” by the law, despite his providing the information to the public at large via “non-enemy” news sources, this sets the precedent of criminalizing of all future whistleblowers. Manning has been imprisoned for over three years and was subjected to psychological torture accompanied by highly abusive treatment for nine of those months. Torture techniques included solitary confinement, humiliation, sensory deprivation, sleep deprivation, and stress positions of being shackled in a 6’ x 8’ cell. Through his imprisonment, Manning has exposed the dark side of the US justice system which keeps his case shrouded in secrecy. One has to question what the US government is doing behind closed doors. Why shield the public from information regarding his case? Pointing out that Amnesty International’s own website urges members of the public to contact them with information on human rights violations, #Amnesty4Manning states, “It’s time we give them a call.” The campaign provides contact information for Amnesty International and even offers several printable postcards that can be mailed to the Secretariat in London. Although the concept of “political prisoner” is rather ill-defined in international law, several workable definitions have been proposed over the years, including by Amnesty International. Under some of these definitions, it seems clear that Manning would qualify. a member or suspected member of an armed opposition group who has been charged with treason or “subversion”. e. if the detention is the result of proceedings which were clearly unfair and this appears to be connected with political motives of the authorities.” (SG/Inf(2001)34, paragraph 10). It’s clear that under any number of these criteria, Manning would qualify as a political prisoner, if not a prisoner of conscience. He was clearly motivated by his conscience and out of concern over the evidence of war crimes, corruption and general wrongdoing committed by his government that he was privy to as an Army intelligence analyst in Iraq. Further, the potential sentence he faces of death or life in prison for the “aiding the enemy” charge that the government is pursuing would clearly be out of proportion to the offense he is accused of. (12:15:11 PM) bradass87: hypothetical question: if you had free reign over classified networks for long periods of time… say, 8-9 months… and you saw incredible things, awful things… things that belonged in the public domain, and not on some server stored in a dark room in Washington DC… what would you do? (12:21:24 PM) bradass87: say… a database of half a million events during the iraq war… from 2004 to 2009… with reports, date time groups, lat-lon locations, casualty figures… ? or 260,000 state department cables from embassies and consulates all over the world, explaining how the first world exploits the third, in detail, from an internal perspective? 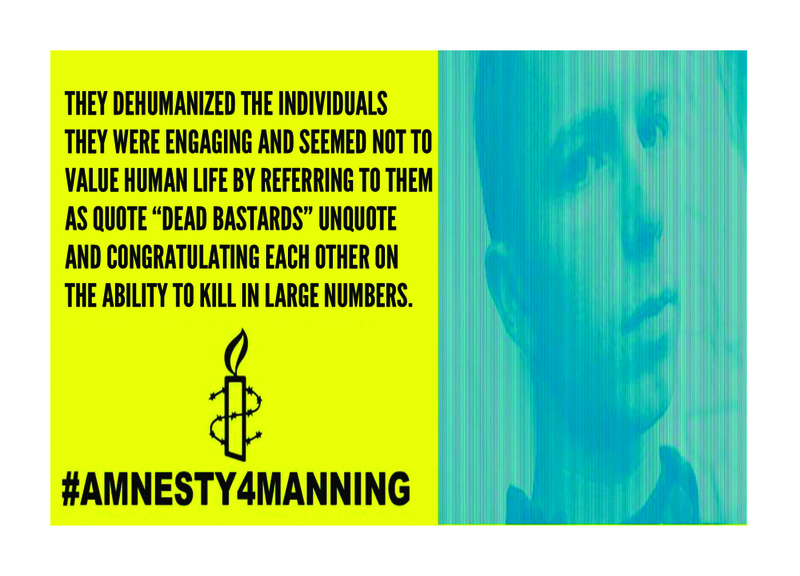 They dehumanized the individuals they were engaging and seemed to not value human life, and referred to them as quote-unquote “dead bastards,” and congratulated each other on their ability to kill in large numbers. At one point in the video there is an individual on the ground attempting to crawl to safety. The individual is seriously wounded. Instead of calling for medical attention to the location, one of the aerial weapons team crew members verbally asks for the wounded person to pick up a weapon so that he can have a reason to engage. For me, this seemed similar to a child torturing ants with a magnifying glass. According to his statement, after being rebuffed by his commanding officer, to whom he attempted to bring information of human rights abuses in Iraq, and after being rejected by traditional news outlets such as the Washington Post and New York Times, he ultimately decided to release a trove of classified information to the anti-secrecy website WikiLeaks. Manning provided three important bodies of documents to WikiLeaks: the Iraq war logs, which consist of 391,000 field reports, including the notorious video of the Apache helicopter gunning down a crowd of Iraqi civilians and Reuters journalists in July 2007 (killing over a dozen of them and injuring several small children). This batch of information also included documentation of the Haditha massacre in which 24 Iraqi civilians, most of them women, children and the elderly, were systematically murdered by U.S. Marines (a crime for which the perpetrators were never punished). Following that release by WikiLeaks, there were 90,000 Afghan war logs, providing a devastating portrayal of the deteriorating war in Afghanistan. The war logs, made public in July 2010, revealed how coalition forces have killed hundreds of civilians in unreported incidents in Afghanistan and how a secret “black” unit of special forces has hunted down suspected Taliban leaders for “kill or capture” without trial. Another document of great public interest expressed suspicion that the Pakistanis were arming and funding the Afghan insurgency. And, finally, Manning’s document release included 260,000 diplomatic cables, possibly the most controversial of his leaks, since the sheer volume called into question whether his actions demonstrated any self-restraint or caution. These leaks, however, also included some of most explosive revelations, and arguably had the most impact globally, including providing the spark for the Arab Spring. These leaks included details on how the U.S. government had lobbied to keep down the minimum wage in Haiti so as to keep manufacturing costs low for American employers and also provided documentation of Tunisian corruption, which played a role in the revolution there. The State Department worked especially hard to promote the interests of Monsanto, the world’s biggest biotech seed company in 2011. Monsanto appeared in 6.1 percent of the biotech cables analyzed between 2005 and 2009 from 21 countries. The State Department exercised its diplomatic persuasion to bolster Monsanto’s image in host countries, facilitate field-testing or approval of Monsanto crops and intervene with governments to negotiate seed royalty settlements. Taken together, the State Department cables, the Afghan war logs and the Iraq war logs have been highly embarrassing for the United States government, and have undermined the regime of secrecy that the Obama administration has so aggressively attempted to maintain. This secrecy is now playing out in Manning’s trial itself, which has been marked by an extraordinary lack of openness. In response to the secrecy surrounding the trial, a group of prominent journalists has filed a lawsuit calling on the military judge presiding over the trial to “grant the public and press access to the government’s filings, the court’s own orders, and transcripts of the proceedings.” None of these have been made available to the public to date. The Center for Constitutional Rights goes to federal court in two weeks to argue the lawsuit seeking press and public access to the court-martial proceedings and documents. For the time being, the Freedom of the Press Foundation is crowd-funding donations to hire a grassroots court stenographer to record trial transcripts, as the U.S. government has so far refused to make transcripts available to the public. 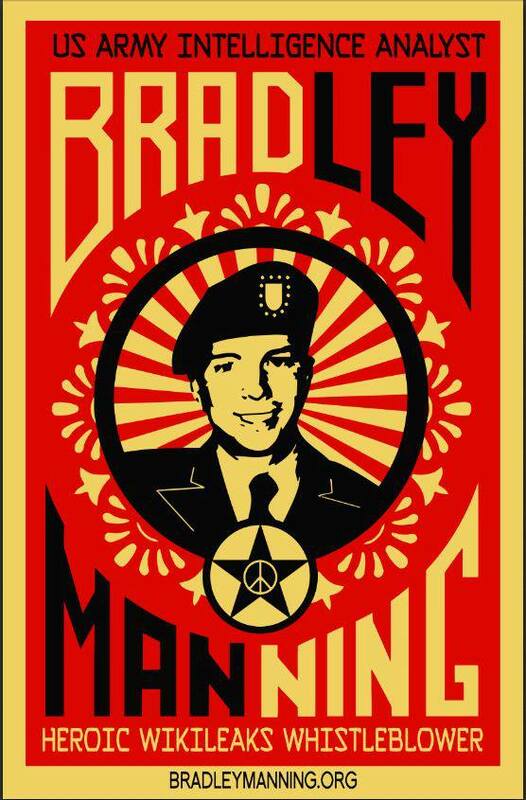 A “Mass Rally for Bradley Manning” is taking place at the site of the court martial at Fort Meade, MD, on June 1 to demand a fair trial for the accused Army private. “Now is the time to get loud and show the government why you oppose the over-prosecution of this brave whistleblower,” says the Center for Constitutional Rights. More information about the rally, including transportation options, are available at the Save Bradley Manning website. 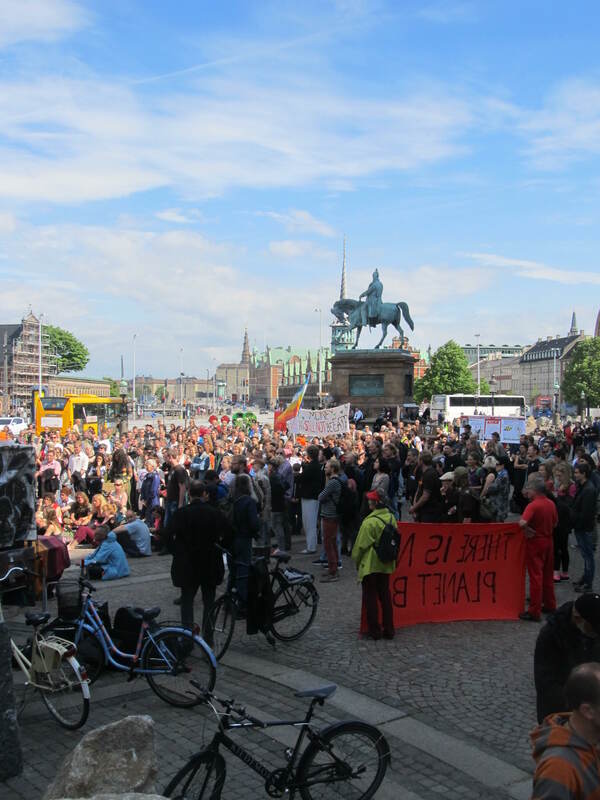 A list of solidarity actions in other cities and countries is available here. 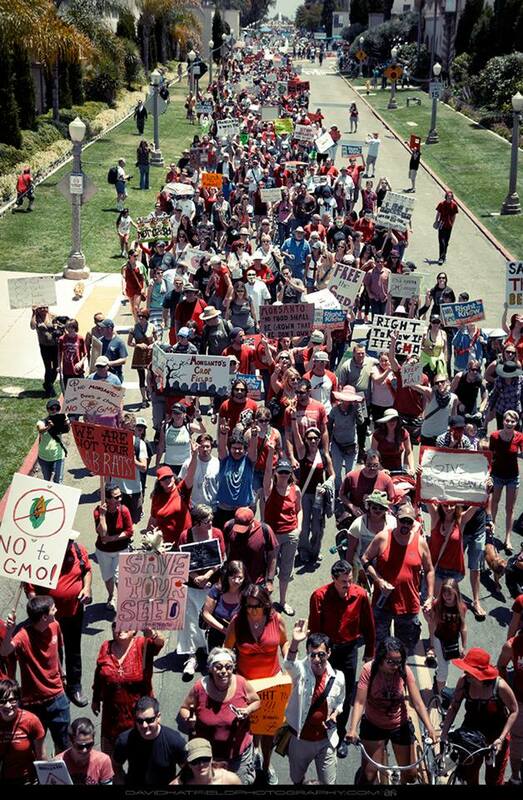 Hundreds of cities across the world held marches Saturday in a first-of-its-kind global demonstration against one of the world’s most powerful (and hated) corporations, Monsanto. According to organizers, more than two million people participated in 436 cities in 52 countries. 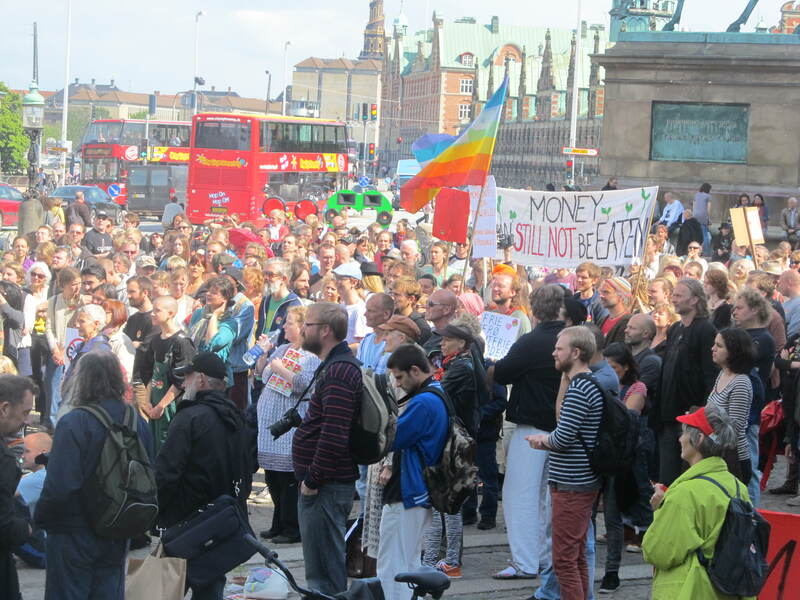 With a focus on the health dangers of the genetically-modified foods that Monsanto has pioneered – including increased rates of cancer, infertility and birth defects – the demonstrations also sought to bring attention to the undue influence that this company wields over the political system, especially in the U.S. This conflict of interest is perhaps best exemplified by the current Deputy Commissioner for Foods at the FDA, Michael Taylor, who has spent his career benefiting from the lucrative revolving door between the food industry and the government agencies that purportedly regulate it. An attorney for the U.S. Department of Agriculture in the 1970s, and then in the 80s, a private lawyer at the D.C. law firm King & Spalding, where he represented Monsanto, Taylor returned to government as Deputy Commissioner for Policy for the FDA from 1991 to 1994. He then went back to private industry as Vice President for Public Policy at Monsanto from 1998 until 2001. When President Obama appointed him to the FDA in 2010, Taylor was a Senior Fellow at the think tank Resources for the Future, working on issues related to agricultural assistance in Africa. Ex-Monsanto executives run the United States Food and Drug Administration, the agency tasked with ensuring food safety for the American public. This obvious conflict of interest could explain the lack of government-led research on the long-term effects of GM products. Recently, the U.S. Congress and president together passed the law that has been dubbed “Monsanto Protection Act.” Among other things, the new law bans courts from halting the sale of Monsanto’s genetically modified seeds. Obama signed the law on March 29. It allows the agribusiness giant to promote and plant GMO and GE seeds free from any judicial litigation that might deem such crops unsafe. Even if a court review determines that a GMO crop harms humans, Section 735 allows the seeds to be planted once the USDA approves them. 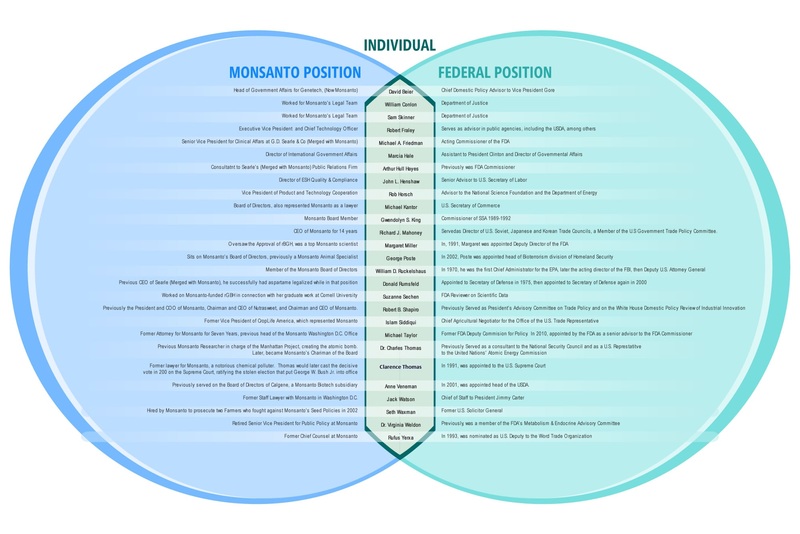 Because policies enacted by corrupt governments often serve special interests such as Monsanto at the expense of the interests of the general public, the revolving door practice so prevalent among Monsanto executives and federal agencies in Washington is prohibited by international law. As a state party to the United Nations Convention against Corruption, the United States has agreed to taking measures to prevent conflicts of interest and corruption in both the public and private sphere. The U.S. has long disregarded these provisions of the UN Convention against Corruption, and in certain cases, such as the cozy corporate-government relationship with Monsanto, has taken the cronyism to another level. As revealed by the WikiLeaks “Cablegate” expose of 2010, Monsanto and other biotech companies enjoy an extremely comfortable status within the State Department, with U.S. diplomats routinely lobbying on their behalf with foreign governments. The U.S. State Department has launched a concerted strategy to promote agricultural biotechnology, often over the opposition of the public and governments, to the near exclusion of other more sustainable, more appropriate agricultural policy alternatives. The U.S. State Department has lobbied foreign governments to adopt pro-agricultural biotechnology policies and laws, operated a rigorous public relations campaign to improve the image of biotechnology and challenged commonsense biotechnology safeguards and rules — even including opposing laws requiring the labeling of genetically engineered (GE) foods. 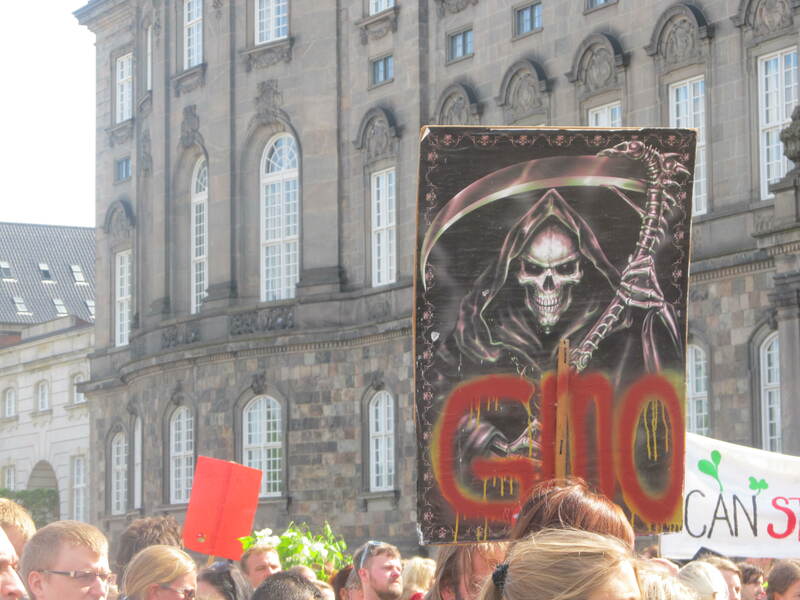 In 2009, the embassy in Spain asked for “high level U.S. government intervention” at the “urgent requests” of Monsanto and a pro-biotech Spanish official in order to combat opposition to GE crops. The State Department has even gone so far as to force other nations to accept biotech crop and food imports against their will. Working with the U.S. Trade Representative to promote the export of biotech crops, the State Department has used the full weight of U.S. diplomacy – with both carrots and sticks – to force nations that do not want these imports to accept U.S. biotech foods and crops. It is in this context that two million people took to the streets over the weekend. Washington’s revolving door corruption and culture of corporate impunity reached new lows last week, raising serious doubts about the United States’ commitment to upholding its international anti-corruption obligations as spelled out in the UN Convention against Corruption. First there was the adoption on Tuesday of the so-called Monsanto Protection Act, which contains a provision protecting the manufacturers of genetically modified seeds from future litigation in the face of potential health risks. Then, two days later, Lanny Breuer, former Justice Department Criminal Division chief, joined a corporate law firm as its vice chairman earning $4 million a year. The controversial Monsanto legislation, officially called the Farmer Assurance Provision – also known as Section 735 of the spending bill HR 933 – effectively bars federal courts from halting the use of genetically modified seeds, regardless of health issues that may be identified with them in the future. While the use of genetically modified seeds, driven primarily by the biotech giant Monsanto, has proved wildly profitable, many argue that there have been too few studies into the potential health risks of this new class of crop. But following the adoption of the spending bill HR 933 with President Obama’s signature last week, even if those studies are completed and they end up revealing serious adverse health effects related to the consumption of genetically modified foods, the courts will have no ability to stop the spread of the seeds and the crops they bear. “This dangerous provision, the Monsanto Protection Act, strips judges of their constitutional mandate to protect consumer and farmer rights and the environment, while opening up the floodgates for the planting of new untested genetically engineered crops, endangering farmers, citizens and the environment,” the group Food Democracy Now said on its website. The group had collected more than 250,000 signatures in a petition for Obama to veto the legislation, but to no avail. 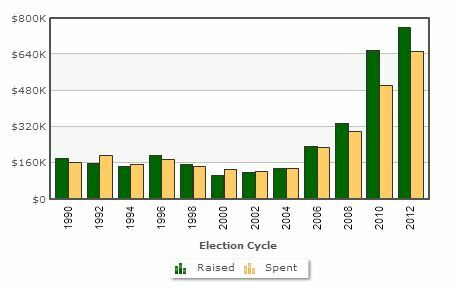 Monsanto, which helped draft the controversial provision in collusion with freshman Sen. Roy Blunt, is very well connected in Washington, having showered millions of dollars in campaign contributions to federal candidates, with contributions spiking in recent years. In particular, the Center for Responsive Politics notes that Sen. Blunt received $64,250 from Monsanto to go towards his campaign committee between 2008 and 2012. Campaign contributions, however, are far from the only way in which Monsanto wields its disproportionate influence in Washington. Its revolving door corruption is legendary in fact, with dozens of Monsanto executives and government officials exchanging titles and paychecks on a fairly regular basis. Michael Taylor, the current Deputy Commissioner for Foods at the FDA, exemplifies more clearly than most the revolving door between the food industry and the government agencies that purportedly regulate it. An attorney for the U.S. Department of Agriculture in the 1970s, and then in the 80s, a private lawyer at the D.C. law firm King & Spalding, where he represented Monsanto, Taylor returned to government as Deputy Commissioner for Policy for the FDA from 1991 to 1994. He then went back to private industry as Vice President for Public Policy at Monsanto from 1998 until 2001. Before President Obama appointed him to the FDA in 2010, Taylor was a Senior Fellow at the think tank Resources for the Future, where he published two documents on U.S. aid for African agriculture, both of which were funded by the Rockefeller Foundation. Rather than using his position of power in the FDA to provide stringent oversight over Monsanto’s business practices, Taylor has instead gone after the agribusiness giant’s competitors, particularly small dairy farms that produce fresh milk. While this strict enforcement of laws requiring pasteurization could be considered a commendable as zero-tolerance approach to food safety, the fact is, under Taylor’s watch the FDA has been letting the highly consolidated industrial meat and factory farm industry off the hook despite growing problems. But this of course is what’s to be expected with Washington’s revolving door. Another fine example of this corruption is the decision by the corporate law firm Covington & Burling to rehire Lanny Breuer, this time as the firm’s vice chairman. 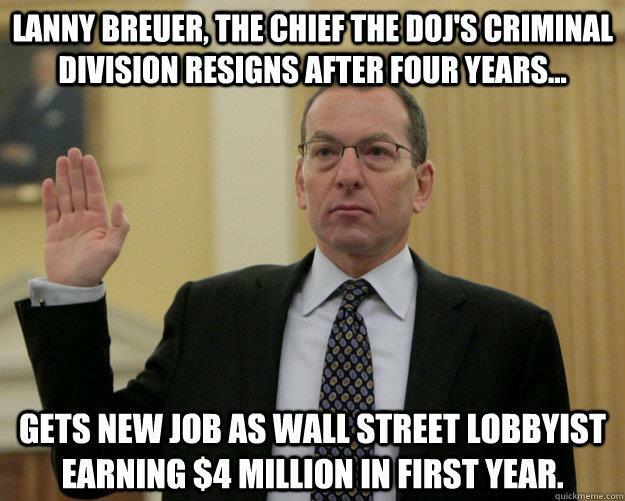 Breuer has spent the last four years at the Justice Department’s Criminal Division, where he led the so-called investigation into the financial crisis. He will now be joining the white-collar defense firm for the third time, and much like he has done at the DOJ, his job will be to defend large corporations from prosecution. This time however, he will be paid $4 million a year. This point was also driven home by an official DOJ directive from 2008, the same year that Breuer took over the Criminal Division. That year, the Justice Department announced a shift in policy, deciding to encourage self-policing by the banks and corporations, rather than vigorously prosecuting their law breaking. After all, “federal prosecutors and corporate leaders typically share common goals,” read the directive. And unfortunately, Obama’s DOJ followed through on this policy of non-enforcement in spectacular fashion. Obama has prosecuted fewer financial crimes than Ronald Reagan, Bill Clinton or either of the Bush presidents. Obama’s Attorney General Eric Holder, another Covington & Burling alum previously making $2.5 million a year, has publicly stated that he won’t go after big banks. 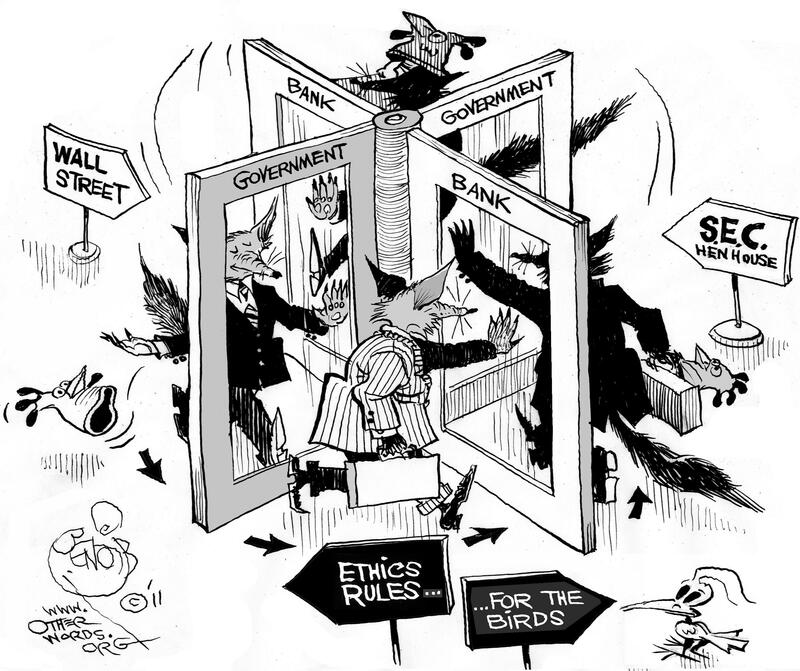 Because of the notoriously bad policies enacted by corrupt governments, the revolving door practice so common in Washington is prohibited by international law. As a state party to the United Nations Convention against Corruption, the United States has agreed to taking measures to prevent conflicts of interest and corruption in both the public and private sphere. Of course, the corporations and the banksters claim that this system works wonderfully. 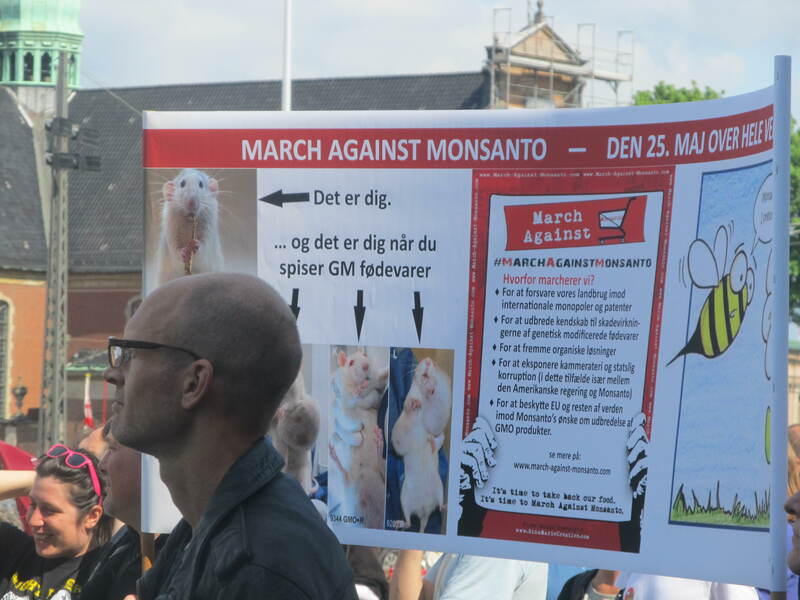 One objection opponents of biotechnology have raised is the fact that some former government employees have gone to work for Monsanto, and some company employees have left the company to take jobs in the public sector. 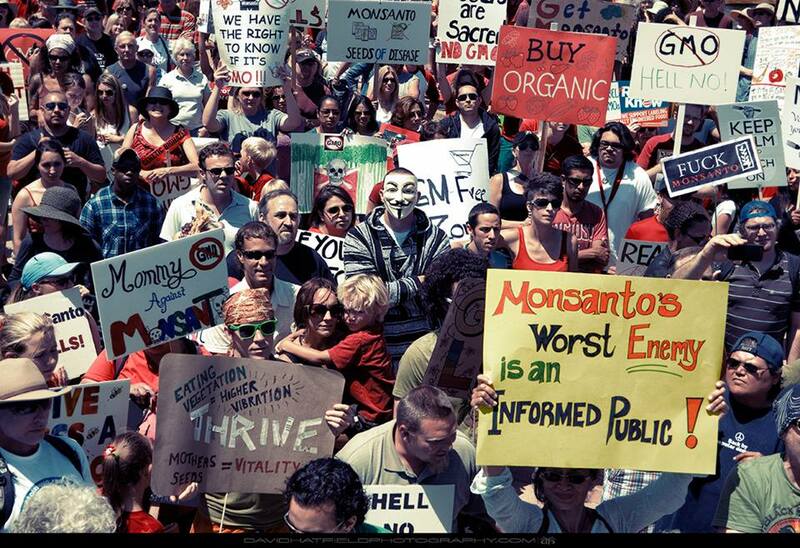 Some critics say this shows collusion by Monsanto and the government. Such theories ignore the simple truth that people regularly change jobs to find positions that match their experience, skills and interests. Both the public and private sectors benefit when employers have access to the most competent and experienced people. It makes perfect sense that someone in government who has concluded biotechnology is a positive, beneficial technology might go to work for a biotech company, just as someone who believes otherwise might find employment in an organization which rejects agricultural biotechnology. While there is some ostensible logic to this argument, it fails to acknowledge the self-evident reality of the overriding profit motive that trumps any possible public-interest gains to be made by allowing corporate chieftains to dictate public policy or ensure the non-enforcement of statutory law. There are in fact common sense approaches that could be taken towards preventing these conflicts of interests, such as those adopted by the European Union on March 19, which help to regulate the revolving door between the European Central Bank and the financial institutions it supervises. a requirement for the ECB to put in place “comprehensive and formal processes” that prevent conflicts of interest, including the possibility of “cooling off” periods of up to two years. an explicit assurance that ECB supervision will be subject to EU legislation on public access to documents. robust democratic oversight in the form of parliamentary approval of the Chair and Vice-Chair of the Supervisory Board and a stronger right of enquiry. While a cynic might say that these reforms are a self-serving and inadequate approach to addressing Europe’s own malfeasance, these measures are nevertheless a far cry from anything the United States is currently implementing to rein in its epic levels of corruption. In fact, far from enacting any anti-corruption legislation, U.S. lawmakers are instead cashing in on the gravy train. It’s clear that this problem of corruption is endemic in Washington, and without any push-back from the people it’s likely to continue to deteriorate. Represent.Us is attempting to rally at least a million American citizens to join its cause, building on popular revulsion to what it deems “the worst political corruption in American history.” After that, it plans to introduce the Anti-Corruption Act to Congress by the end of 2013 and solicit cosponsors. Perhaps what is more needed though is a reinvigoration of the spirit that brought tens of thousands of Americans into the streets and into downtown parks as part of the Occupy Wall Street movement that surprised the world in late 2011. While that particular movement may have turned out to be little more than a flash in the pan, the spirit of indignation and rebellion that fueled the protests has likely only intensified. To harness and refocus that energy is what is needed now more than ever if there is any real hope in countering the type of blatant corruption and the culture of impunity on display in Washington right now. Multiple fronts have opened up in recent weeks in the battle against corruption in the United States, with particular attention focusing on the corrupting influence of the revolving door between the public and private sectors. With Securities and Exchange Commission Chair Mary Schapiro announcing in November that she would step down, leaving behind an agency riven by partisanship and the influence of a well-financed financial industry lobby, progressives launched a campaign to pressure President Obama to pick a strong progressive replacement. CREDO Action launched a petition urging President Obama to “[a]ppoint an S.E.C. chair who will hold Wall Street accountable.” Obama has already named current SEC commissioner Elisse Walter as the new acting SEC chairman, but a long-term replacement is expected in the near future. A number of outstanding issues before the SEC could have an enduring impact on corporate and financial sector governance for years to come. The SEC, for example, is considering money market reforms and market structure safeguards and still needs to write a number of major rules dictated by the 2010 Dodd-Frank financial reform law, including a rule to prohibit banks from trading for their own accounts. CREDO worries however about indications that the president is leaning towards appointing a Wall Street insider to the position, which could render newly adopted financial reforms toothless. The New York Times reported for example that Sallie Krawcheck, the former head of global wealth management at Merrill Lynch and a former top executive at Citigroup, is being considered for the position. The petition names several alternative ideal choices, including former prosecutor and TARP inspector general Neil Barofsky, former Delaware Senator Ted Kaufman, former Senate aide and leader of the pro-reform group Better Markets Dennis Kelleher and former FDIC chair Sheila Blair. But with the Obama administration’s track record in turning to industry insiders to implement policy, it would, to say the least, be a break from precedent to see a true “champion for accountability” taking the helm at the Securities and Exchange Commission. Obama provided an indication of his inclinations to entrust public policy with Wall Street insiders from the earliest days of his administration after being elected on a platform of “hope and change” in 2008. Elected in the midst of a crushing economic crisis brought on by a decade of orgiastic deregulation and unchecked greed, Obama had a clear mandate to rein in Wall Street and remake the entire structure of the American economy. What he did instead was ship even his most marginally progressive campaign advisers off to various bureaucratic Siberias, while packing the key economic positions in his White House with the very people who caused the crisis in the first place. This new team of bubble-fattened ex-bankers and laissez-faire intellectuals then proceeded to sell us all out, instituting a massive, trickle-up bailout and systematically gutting regulatory reform from the inside. Former acting director of the Office of Management and Budget Jeffrey Zients, who once founded Portfolio Logic, which invests heavily in health-care companies. Former White House Chief of Staff Rahm Emanuel, who earned a reported $16.2 million working in investment banking for Wasserstein Perella for two and a half years. He also sat on Freddie Mac’s board, making a total of $320,000 from the mortgage finance company. Bill Daley, Emanuel’s successor as chief of staff, who worked at Chicago’s Amalgamated Bank, and later JPMorgan Chase, where he reportedly made about $5 million per year. He’s also served as a corporate lawyer, the head of SBC Communications, and on the boards of Boeing, Abbott Laboratories, and Loyola University Chicago. Daley’s replacement Jacob “Jack” Lew, the previous head of the Office of Management and Budget, who previously worked at the alternative investments unit of Citigroup. As chief operating officer of the unit, which profited enormously from betting on the collapse of the housing bubble, Lew reportedly made $1.1 million, possibly not including bonus income. Lew’s predecessor at the OMB, Peter Orzsag, who left the White House for a job at Citigroup, in global investment banking, pulling in an estimated $2 million to $3 million per year. The heads of the National Economic Council — Larry Summers and now Gene Sperling — also benefited from Wall Street. Summers worked at the hedge fund D.E. Shaw after leaving his post as the president of Harvard University. There, he earned $5.2 million in 2008, plus another $2.7 million in speaking fees for engagements, including many at Wall Street banks. Sperling earned $887,727 from Goldman Sachs for work advising on a nonprofit project in 2008, as well as $158,000 for speeches, many to financial firms. The securities industry earned $82.52 billion in profits during the first two and a half years of Obama’s presidency, compared to $77.17 billion total under President Bush, according to data compiled by The Washington Post. Another industry set to profit substantially from Obama administration policies is the health insurance industry. Because the Affordable Care Act, commonly known as “Obamacare,” includes mandate that every American must purchase the product of the private health insurance industry but no public alternative was included in the legislation, the law was a huge gift to that industry. The key legislator of this law was the Democratic Chairman of the Senate Finance Committee, Max Baucus, whose committee took the lead in drafting the legislation. But as Baucus himself has stated, it was Elizabeth Folwer, his chief health policy counsel who took the lead in drafting it. Prior to joining Baucus’ staff, Fowler was the Vice President for Public Policy and External Affairs at WellPoint, the nation’s largest health insurance provider. And when that health care bill was drafted, the person whom Fowler replaced as chief health counsel in Baucus’ office, Michelle Easton, was lobbying for WellPoint as a principal at Tarplin, Downs, and Young. When Obama needed someone to oversee implementation of the bill after it passed, he chose Fowler. Good government groups roundly condemned Obama’s choice as a violation of the “spirit” of governing ethics rules and even “gross”, but those objections were ignored by the White House. She then became Special Assistant to the President for Healthcare and Economic Policy at the National Economic Council. Now, as Politico’s “Influence” column reported on December 4, Fowler is leaving the Obama administration to return to the private health care industry, where she stands to make a fortune from the legislation that she crafted and helped implement. “Elizabeth Fowler is leaving the White House for a senior-level position leading ‘global health policy’ at Johnson & Johnson’s government affairs and policy group,” Politico briefly noted. It is also, incidentally, a violation of international treaty obligations to which the United States has subscribed. As a state party to the United Nations Convention against Corruption, the U.S. has agreed to taking measures to prevent conflicts of interest and corruption in both the public and private sphere. Prevent conflicts of interest by imposing restrictions, as appropriate and for a reasonable period of time, on the professional activities of former public officials or on the employment of public officials by the private sector after their resignation or retirement, where such activities or employment relate directly to the functions held or supervised by those public officials during their tenure. With its endlessly revolving door between government and private industry, Washington is flagrantly violating the letter and spirit of this provision. There is some hope in the new year however to bring the United States into compliance with its anti-corruption obligations and to restore some modicum of democratic legitimacy in Washington. “Today, politicians routinely move straight from Congress to lucrative lobbying jobs on K Street, in order to influence their former colleagues and friends,” Represent.Us laments. “This corrupts policymaking in two ways: members and their staff anticipate high-paying jobs with lobbying firms, and routinely do favors to their future employers while still in Congress; and once out of congress they enjoy undue access and influence to members of Congress. Other key points of the proposed legislation include stopping politicians from taking bribes, requiring SuperPACs to abide by the same contribution limits as other political committees, limiting lobbying donations and ending secret money in politics. Represent.Us is attempting to rally at least a million American citizens to join its cause, building on popular revulsion to what it deems “the worst political corruption in American history.” After that, it plans to introduce the Anti-Corruption Act to Congress by the end of 2013 and rally cosponsors. To add your name to the Represent.Us petition, click here.